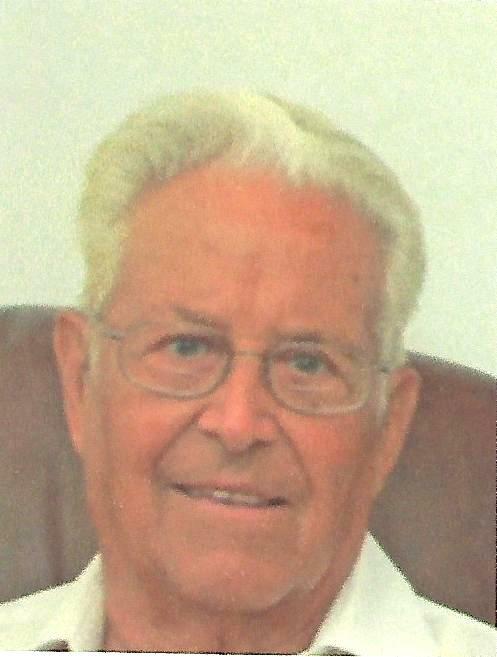 LaVerne H.”Hap” Kinzinger, 91, of New Athens, IL, born April 25, 1927 in New Athens TWP, IL passed away on Wednesday, April 3, 2019 at Memorial Hospital – East in Shiloh, IL. He was a life long farmer and also a foreman at Behnken Trucking Service in New Athens. LaVerne was a member of several organizations including; St. John United Church of Christ in New Athens, IL and also served on the church board, the New Athens Unit #60 School Board, Mascoutah Moose Lodge, Rotary International, New Athens Lions Club, the Progressive Grange, St. Clair County Farm Bureau, IL Farm Bureau, National Farmers Organization and the United States Dept. of Agriculture. He had also served as the Lenzburg TWP Highway commiss ioner. In addition he received the St. Clair County 4-H Livestock Boosters Loyal Supporter award. Many referred to LaVerne as “Hap” due to his happy nature. However, he was most proud to be called a husband, dad and grandpa. If you knew nothing about Hap, just know that he was a hardworking, loyal and loving man who put his family first above all else. He married his sweetheart, Gladys Kinzinger, nee Dintelmann, at the age of 20 and had 71 wonderful years of marriage. He had three daughters and was so proud of the accomplishments they (and their children) achieved. He was there for every milestone and celebration, no matter the distance, always being their greatest supporter. He will be deeply missed by his family, but his loving values will forever be passed on..
Mr. Kinzinger was preceded in death by his parents; Rolland and Clara, nee Sturm, Kinzinger, 1 brother; Norman Kinzinger, 1 brother-in-law; Wilfred Hammond and by 1 sister-in-law; Lela Kinzinger. “Hap” is survived by his dear wife Gladys, nee Dintelmann, Kinzinger who he married on April 26, 1947, 3 daughters; Sharon (Rod) Parker of Towanda, IL, Shirley (Scott) Snell of Woodridge, IL and Sheryl (Terry) Laflen of Swansea, IL, 2 brothers; Cletus Kinzinger of New Athens, IL and Ralph (Vera) Kinzinger of Freeburg, IL, 1 sister; Loretta Hammond of New Athens, IL, 1 sister-in-law; Carol Kinzinger of New Athens, IL, 7 grandchildren; Shannon (Joe) Hobson, Shandra (Matt) Ebersole, Brittany (Erik) Snell-Dahms, Kelly Snell, Haley (Mike) Snell-Sparapany, Brad Laflen and Kristen (Phil) Webber, 5 great grandchildren; Alexis and Trevor Hobson, Ellie Ebersole, and Nora and Stella Webber and nieces, nephews. Memorials: Cedar Trails Garden (that he funded and maintained), St. John United Church of Christ, The Sanctuary Church, Cedar Trails Senior Living and Heartland Hospice. Visitation: Friends may call from 4 to 8 p.m. on Friday, April 12, 2019 and 9 to 11 a.m. on Saturday, April 13, 2019 at St. John United Church of Christ in New Athens, iL. Heil-Schuessler Funeral Home is in charge of arrangements. So sorry for your loss. Such a beautiful tribute to a remarkable man. Hap was a remarkable man. I met him late in his life, but his life story speaks for itself. My condolences to the family. I’m proud that some of his genes make up my two grand daughters. My sincerest condolences to the family. Will keep you all in my thoughts and prayers.